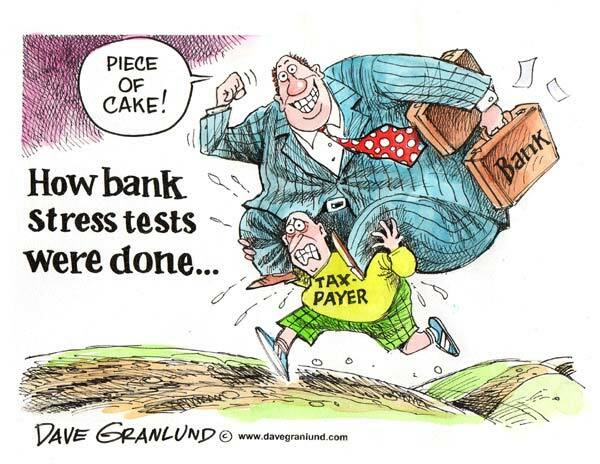 A Stress testing is a form of test that aims to evaluate how a system (financial system) or an entity (a Bank in this case) can cope when subjected to amounts of stress that goes well beyond the ‘normal’ expected operational environment. The goal is to observe the results to determine the resistance range and breaking point. During the recent stress tests conducted by the EU Banks under the supervision of the European Banking Authority only 8 banks out of the 90 tested failed to meet the requirements. The EBA said on July 15 that the stress tests were ‘rigorous’ and based on ‘robust’ assumptions. The EBA further claimed that the results demonstrated the strength of European Banks as even the 8 banks that failed had only a combined capital shortfall of 2.5 billion euros. Isn’t it a Good piece of News? Not quite and the market reaction was not the one the EBA expected, as most European Banks share fell sharply after the test result were announce with so much ‘fanfare’. The EBA got it all wrong. It has become painfully obvious that the aim of the stress test was not about evaluating the true strength of EU financial institutions to face a worse case scenario, but rather to rebuild the confidence of the market in those institutions by giving them the stamp of approval from the authorities that they are safe! This tactic might have worked a few months ago but in the present circumstances with news every day painting the bleak picture of an impending Sovereign Default crisis starting with the possible default of Greece and the potential of contagion to Spain, Italy and more, the stress test conducted by EBA look like a bad a joke. Not only it failed miserably to bolster confidence of the market but even worse it damaged the credibility of the EBA and of the EU Banks as a whole. Take just one of the key assumptions that the EBA has used for this round of stress testing about the Sovereign Debt, the worse case scenario used involve applying a ‘haircut’ of just 15% to Greek debt. Well when you know that Greek bonds are currently trading in the market at half their face value, how can the EBA seriously expect investors to believe that they have properly tested the banks using a ‘rigorous’ and ‘robust’ approach? Well trust is indeed critical for success, but it is NOT JUST a PR (Public Relation) job. From a Risk Management perspective, Trust must be based on Integrity in order to be build on solid foundations that will not shake at the first tremor. How could we trust banks and do confidently business with them if we know that what they say is NOT reliable. Unfortunately despite the recent financial crisis and all the resulting ‘soul-searching’, it seems that Integrity is apparently still something that politicians and bankers have to learn to follow. But is it too much to ask from them? This entry was posted in General, Reputation Risk Management, Risk Assessment, Risk Communication & Perception and tagged Integrity, Sovereign Debt, Stress testing. Bookmark the permalink. ← Sony Reputational Nightmare: How to piss off 77 millions customers! incredibly engaging and also the blog post was a wonderful read.